The September LSAT is just 6 weeks away, and I have been fielding a lot of questions about LSAT prep methods and self-study options. To help answer those questions, I went straight to the source: Dave Killoran is the CEO of PowerScore LSAT Preparation. 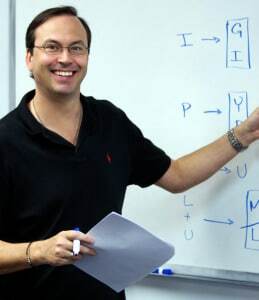 A graduate of Duke University, he is an expert in test preparation with over 20 years of teaching experience and a 99th percentile score on an LSAC-administered LSAT. In addition to having written PowerScore’s legendary LSAT Bible Series and many other popular publications, Dave has overseen the preparation of thousands of students and founded two national LSAT preparation companies. He was gracious enough to answer these questions for the Law School Expert Blog. 1. The PowerScore Bibles are hugely popular with self-studiers and prep-course takers alike. Why do you think that is? What makes it different from other LSAT prep books out there? I think there are a few different reasons the books have turned out to be so popular. When they initially came out, they were the first books to use real LSAT questions in the text, and that showed students that we were serious about using techniques that were designed to attack the types of LSAT problems they would see on test day. The books are also very comprehensive and systematic—whereas a lot of LSAT books cover the whole test in 400 pages, each LSAT Bible covers a single section in that many pages (and more!). So they often go far deeper into each topic, and on a test as tough as the LSAT, that depth is a big advantage. I also think that the support we provide for each book really gives people a safety net in case something doesn’t seem to make sense, or if they need more advice. We have a free discussion forum where I answer questions about the books, as well as extensive free supplementary materials and drills for each book. But, the methods and techniques presented are probably among the main reasons for the each book’s popularity. We have a developed a really clear and comprehensive system for attacking each section of the LSAT, and the books do a good job of relaying that systematic approach. I think students read them and are able to see how they really could improve quickly, and suddenly the LSAT doesn’t seem quite as tough. 2. You’ve been teaching the LSAT for about 20 years. What are some of the biggest mistakes people make? I think that people underestimate the test or imagine it to be more complicated than it is, both of which undermine success. Do you see this also? How can people put the test in perspective in order to conquer it? I’m going to answer this question in reverse order! The best perspective is to realize that this is a test that can be learned, and that if you put in enough time and effort, you will improve. The LSAT, like all standardized tests, relies on certain patterns in order to produce predictable results. In other words, the test is very similar from administration to administration, so that makes it something that you can ultimately master. However, at first glance, those patterns and protocols are hard to see, and so at first students can sometimes feel that the questions make no sense or that there’s no way to organize a plan of attack. That leads to what I see as the biggest mistake: failing to prepare for it properly. Too many people walk in and take the exam cold, or try to prepare for it too quickly. This is an exam that can be learned, but it takes time to absorb how it works. So, if you are looking to take the LSAT, the best piece of advice you can get is to start studying at least a few months in advance. 3. What is the most challenging part of the LSAT for most LSAT takers? I think it’s both Logic Games and timing. What is the most universal advice you can give to people to understand logic games and to work on their timing? From a section standpoint, it’s most definitely Logic Games. But, overall, I’d agree that it’s timing—everyone has to deal with time pressure on this exam. As for universal advice, that’s a tough one! Probably the best advice for both areas is practice. Learn how to attack each section, and then practice those methods and techniques repeatedly until they become second nature. That will allow you to become faster and more confident (which then helps you go even faster still). 4. If someone has a budget of $100 for LSAT prep, what would you recommend that they do to prepare? I’d say they should buy the LSAT Bible that covers their weakest section, and then spend the rest on getting books of 10 real LSATs from LSAC. That way you get some strategy help, and material to practice with. The one thing about the LSAT is that it’s very tough to prepare for under $200 or so. And, in a sense you can be short-changing yourself, because maybe spending a bit more time and getting some additional study materials will lead to a high enough LSAT score to start bringing in more money and scholarship offers during the application process. So try to balance where you are scoring with the score you need, as well as the score that starts returning money to you when the acceptances come in. 5. If someone has a budget of $500 for LSAT prep, what would you add? When the budget expands, you begin to have more options and it becomes harder to give a blanket answer. At this level, you could choose among having more self-study tools, or you could consider various courses, or perhaps even a tutor. So it depends on exactly where you are scoring and what areas of weakness you have. At the least, I’d choose an avenue that allows for doing as many practice tests as possible, and I’d also make sure you had the materials to learn about each section of the LSAT fully, so I would advise such students to consider a course, or perhaps the LSAT Bibles and Workbooks for those more comfortable with self-study. 6. If someone has a $2000 budget for LSAT prep, what should they be taking advantage of? Is it different for each applicant? For example, how can you tell if someone would benefit more from spending that money on private tutoring versus an LSAT class? At this level, there are so many preparation options to choose from that it is really hard to say without having more details! I’m a big fan of trying to get the exact right fit of preparation to the person, and although you might have $2000 to spend, you might not need to spend all of it. When it comes to classes vs tutoring, classes are really good at covering a lot of material for a relatively low cost, and they provide a solid structure for your preparation. If you feel like there are a lot of areas you need to learn about, or if you feel you might not have the motivation to force yourself to study, classes are extremely helpful. Tutoring, on the other hand, is really good for focusing on exactly what is bothering you, but the one downside is that it costs a lot more. So, tutoring to me is a really great surgical solution: you can efficiently focus on exactly the areas you need to fix. The way we can tell what is best is by talking to you. Then we can find out things like what parts of the LSAT are giving you trouble, which approach is the best fit for your learning style, how much time you have to study, and so on. That allows us to make suggestions as to what path would benefit you the most. 7. I know you are working on developing a way to help test takers who struggle with anxiety on test dayto the extent that it inhibits their ability to perform on the exam. Can you tell me more about this effort and why this interests you? Sure! Test anxiety is kind of a hidden problem that surrounds all standardized tests. As I worked with students through the years, I kept encountering it, and it’s one of the most frustrating things to deal with (for both student and teacher). I’d work with students who clearly knew the material and had the ability to produce a really high score, but when they walked into the real thing, their anxiety would rise up and the result was a performance that wasn’t just a little lower than their best, but a lot lower. They might have Harvard-level abilities, but their anxiety wasn’t allowing them to ever show it. Consequently, a long while back we began incorporating elements into our LSAT courses that focused on combatting test anxiety and strengthening test mentality. And the feedback was really great! But, I felt that there was even more that could be done, and so for a while now I’ve been working with students in an attempt to develop usable tools for alleviating test anxiety. The usual sort of advice you hear is, “take a moment to relax, and take a few deep breaths.” That might help for someone with a very, very mild case of anxiety, but for students who have more significant issues, it doesn’t do much! We’re trying to get to the core of the issue, and that has involved a lot of research and specific one-on-one work with students suffering through this problem. At the end of all this, I’m hoping to write a book about the topic that is a part discussion and part self-help manual—and if it helps even a few students overcome this problem, it will definitely be worth it! On that point, if you are a student suffering from moderate to severe test anxiety, please feel free to get in touch with me about it! Really great info here! I especially appreciate the recs for various budgets.